Kyle Hendricks and the Cubs agreed Tuesday to a deal that adds $55.5 million to his contract from 2020 to 2023, guaranteeing he will receive $62,905,000 over the next five seasons. 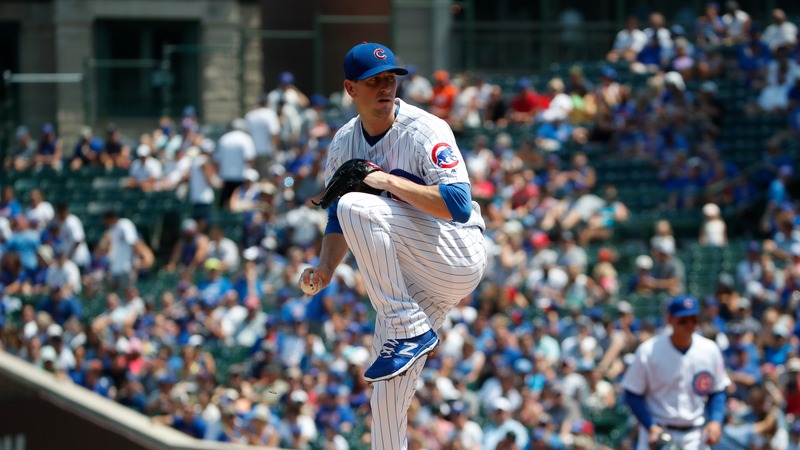 MESA, Ariz. (AP) — Kyle Hendricks’ focus is on the season, among the reasons the Cubs didn’t hesitate to give the right-handed pitcher a new deal. Hendricks and the Cubs agreed Tuesday to a contract that adds $55.5 million from 2020 to 2023, guaranteeing the 29-year-old will receive $62,905,000 over the next five seasons. He had agreed in January to a one-year deal for $7,405,000 and would have been eligible for arbitration next winter. “I love everything about being a Chicago Cub,” Hendricks said. “I love everything about the city, about the fans and especially about my teammates in the clubhouse. That’s where my focus is at. As much as I’ll revel and be excited about this, our focus 100 percent is on (Opening Day) and the season. That’s what I told the guys in there. I want to be with them as long as I can.” __MORE:__ [Our complete MLB coverage](https://www.betchicago.com/mlb-betting) Hendricks' new deal adds salaries of $12 million for 2020 and $14 million annually from 2021-23. The agreement includes a $16 million team option for 2024 with a $1.5 million buyout, and the option would become guaranteed if he finished among the top-3 in Cy Young Award voting in 2020. There are $3 million annually in escalators based on finishing among the top-10 in Cy Young Award voting. Hendricks’ deal is somewhat patterned after the deal agreed to last month by St. Louis pitcher Miles Mikolas, who was guaranteed an additional $68 million from 2020-23, raising his total to $75.25 million over five seasons. Hendricks was scheduled to start Tuesday in the spring training finale against Boston, but was scratched because he underwent an MRI as part of his physical. The Cubs open Thursday at Texas, and Hendricks will throw a bullpen there. “He’s a great example for every player we have in the organization,” Cubs president of baseball operations Theo Epstein said. “Kyle is making a big step forward as a leader. A lot of guys look up to him and the way he goes about his business.” Hendricks does not fit the norm of starting pitchers, opting to rely on location rather than velocity. He has gone 52-33 with a 3.07 ERA in 132 starts and one relief appearance in five seasons. His 3.07 ERA is the fifth-lowest among active pitchers with at least 100 starts. “Watching the way I pitch and getting guys out at the big league level will hopefully translate to younger pitchers just learning more of a pitching style and not relying on velocity so much,” Hendricks said. “I just want to be the best pitcher I can always be and at the end of the day, when my career is said and done, to have no regrets.” The Cubs acquired Hendricks from the Rangers in July 2012. Epstein remembered how scouts boasted about the right-hander’s makeup. “They all said he gets the absolute most out of his abilities,” Epstein said. “Here we are seven years later and it’s 100 percent true. If you look at the numbers, he’s one of the most effective starting pitchers in the game,” Epstein said. “The names on that list are guys on Hall of Fame trajectories. Kyle’s in rare air for what he’s done.” Last season, Hendricks led the Cubs with a career-high 33 starts and 199 innings. He closed the season 9-3 with a 2.65 ERA in his final 16 starts. __PLAY:__ Our [free daily contests](https://betchicago.chalkline.com) for the chance to win a BetChicago prize pack.